American Airlines- New Service From Dallas to Springfield, Ill.
American Eagle Airlines, the regional affiliate of American Airlines, today announced nonstop service between Dallas/Fort Worth International Airport (DFW) and Abraham Lincoln Capital Airport (SPI) in Springfield, Ill. American Eagle will start service April 5, 2011, and will operate flights with 50-seat Embraer ERJ-145 jets. 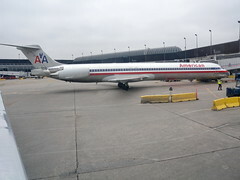 American Eagle operates over 1,500 daily flights to nearly 160 cities throughout the United States, Canada, the Bahamas, Mexico and the Caribbean on behalf of American Airlines. American, American Eagle and the AmericanConnection® airlines serve 250 cities in 40 countries with, on average, more than 3,400 daily flights. The combined network fleet numbers more than 900 aircraft. American’s award-winning website, AA.com, provides users with easy access to check and book fares, plus personalized news, information and travel offers. American Airlines is a founding member of the oneworld® Alliance, which brings together some of the best and biggest names in the airline business, enabling them to offer their customers more services and benefits than any airline can provide on its own. Together, its members serve approximately 750 destinations in nearly 150 countries and territories. American Airlines, Inc. and American Eagle Airlines, Inc. are subsidiaries of AMR Corporation. AmericanAirlines, American Eagle, AmericanConnection, AA.com We know why you fly and AAdvantage are registered trademarks of American Airlines, Inc. (NYSE: AMR).